In addition to being immersed in preparing the next Korrika, this cooperative works day and night to enhance the knowledge and use of our language throughout the Basque Country: euskaltegis (Basque language schools), barnetegis (residential Basque courses), workshops, Basque strategic plans, advice, translation…in short about 16,000 people take part in the different initiatives of AEK. They are well aware that they work with “people and emotions” and there is much still to be done. “Our commitment is no other than to end up closing doors, but not because of the crisis, but because finally we have fulfilled our mission”, claims half-jokingly Mertxe Mugika, general coordinator of AEK Euskaraz Kooperatiba Elkartea. At the end of the day, the main objective is the normalisation of Basque in the Basque Country. With this aim, the cooperative has more than one hundred euskaltegis (Basque language schools) with a total of 530 partners. According to Mugika, “AEK is an organisation with a track-record of over 40 years, but in 2002 went from being a cultural association to becoming a cooperative, as we believed that the cooperative model offered us a route that was linked to our values, in other words, working democratically and with ourselves being the ones who managed the company”. At the present time they have euskaltegis throughout the Basque Country, four of them working as central headquarters. Seventeen years ago, AEK had several hundred teachers and co-workers who created the cooperative. All of them together. 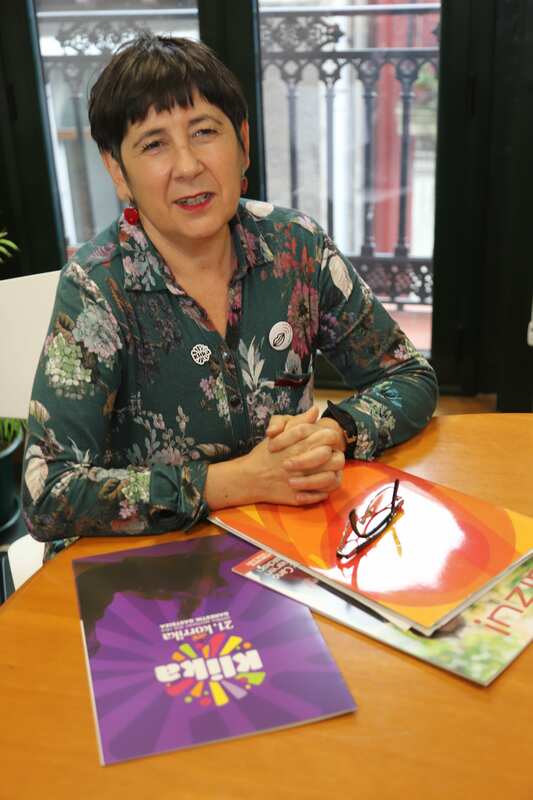 There is no doubt about their main mission: “That all people who live in the Basque Country know Basque and that citizens and all stakeholders in the Basque Country use this language to go about their normal day-to-day business”. And what do they do to achieve this? The cooperative works on all aspects of normalisation of the language. Specifically there are three main areas: knowledge, use and promotion. In the first case, the main scope of work is adult literacy, for which they have classes in Basque which everyone knows about. “At the present time, we have around 10,000 people receiving classes in our euskaltegis. Last year, for example, the course concluded with 12,000 people enrolled. We give in-person classes, self-learning, online, in barnetegis. There are multiple options” the general coordinator explained. Secondly, with regard to the use of the language, the cooperative has a bilingual consultancy, Ahize, that offers services and activities to promote and reinforce the use of the language. “We draw up strategies to promote the use of the language, whether in the public administration or in different associations. We have numerous clients in this field. Among others, we are developing the Basque strategy with the Osasuna Football Club Foundation; we are preparing the blueprint to design and set up the linguistic management system in Bilbao Metro; with the Lemoa Town Council we have been designing and developing their internal plan of use; we have also undertaken the design, diagnosis and evaluation of the strategy for Basque in the Parliament of Navarre,” comments Mugika. In the field of linguistic advice, at the present time we have a product that is working extremely well: Eusliderrak. This involves nothing less than workshops to create new linguistic habits. In the words of the coordinator, “we are conducting workshops in numerous venues: schools, work centres… Ultimately, the aim is to create new habits using the language related to questions of leadership, constantly supported by reflection processes. The aim is to change the behaviour that we have with the language and reinforce linguistic leadership. Bearing in mind the importance which a leader has in using Basque, we conduct workshops focusing on this aspect, which in short, will consist of talks, short practice sessions and a series of complementary sessions of linguistic training”. With regard to use, the cooperative also has practical activities such as Berbalagun and Gurasolagun. “These are programs that bring together people who are learning the language with those who already know it, so they can practise. This is one aspect we put a lot of emphasis on”, she adds. The third area is that of promotion. And within this area the Korrika is the activity that most stands out. “Every two years we host one of the strongest initiatives related to Basque. 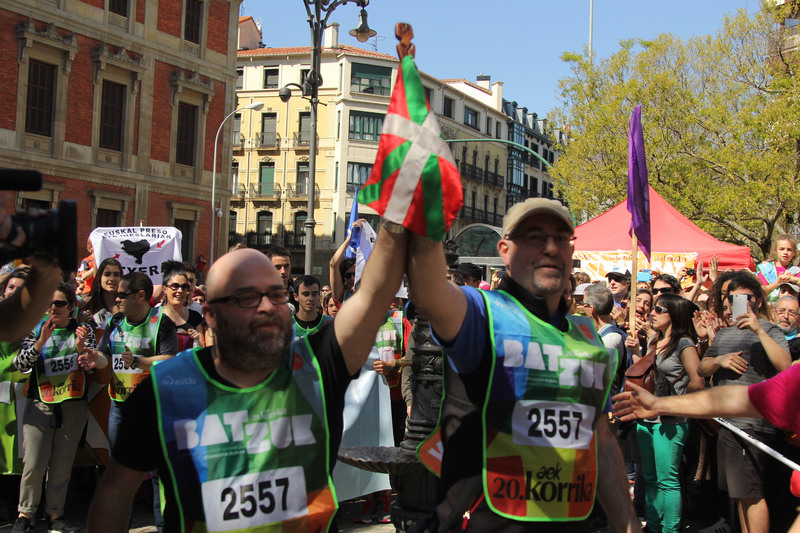 The slogan of this edition will be Klika, the choice of living in Basque, as we believe it is time to assume commitment. On the road to revitalising the language, popular opinion is strong and the next stage is klika, to choose to live in Basque”, she explained. This year’s edition is the 21st and will start at Gares-Estella and finish at Gasteiz-Vitoria. With this in mind, Fermin Muguruza has been commissioned to prepare a novel song and a video clip. “With the song we hope to transmit the message of choice, making it clear there are people like Fermin who decide to klika, to learn Basque and take the initial step. And the singers La Furia and Mad Muasel have also made a great contribution in this sense, as up to now they have sung in Spanish or English, and in this song they also sing in Basque. With this coral video clip we aim to say the same as we will transmit in the Korrika; and also it transmits a lot of energy”. Attracting people to Basque is the main aim of AEK, and with this video clip “we want to reach people who have no direct relation with the language. This is the intention, and also, of course, to make a new contribution to the world of music”, comments Mugika. The magazine Aizu is also understood as a commitment to Basque. The cooperative publishes this magazine every month. “All our customers receive it, as the intention is to be a benchmark in Basque culture”. In addition to all this, the cooperative has developed the translation service Euskaratuz. “We work very much with companies. One of our customers, for example, is the opera company ABAO”. With the aim of extending knowledge of Basque in the Basque Country “a lot of work has been done, but there is still a lot to do. Half of the population in the Basque Country does not know the language, so there are still many people who could learn the language and we have to continue taking steps to expand its use. This is the key to our future: obtain results in the shortest time possible”. With a view to the normalisation of the language, Mugika admits that there are increasingly more blueprints in Basque but in the socio-economic sphere there is still “a long way” to go. “And there are also the new technologies which means that the demand multiples, as there are increasingly more customers and our aim is to respond in the best possible way to all of them, adapting ourselves through continuous improvement to the needs of all these people who need our services, creating new and more efficient products”, the general coordinator points out. And if all this seems little, they also create materials to learn Basque, always following the latest trends in society. “We work with people and our products will always incorporate ways to impact people; we try to bring emotions into play”. In fact, AEK believe deeply in cooperation. “The normalisation of Basque is a job which necessarily involves cooperation”, she underlines. All in all, they believe that Basque “has to gain space” and undoubtedly they will continue to be committed body and soul to this objective. “Our contribution continues to be very necessary”. This entry was posted in NEWS and tagged Cooperativism, Interview, Interview, Others, Values. Bookmark the permalink.